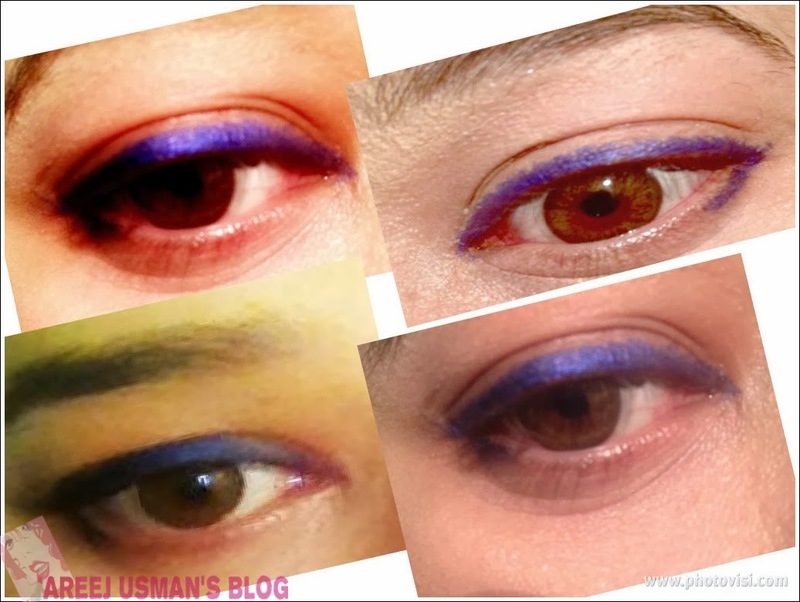 How many of you love some glam eyes.Recently I got tired of that usual black smokey eye liner look.I wanted to go for something new.I was really impressed by some runway models doing their eyes in neon colors.The idea suddenly appealed to me so much that I went looking for an eye pencil for myself that would bring some color to my eyes. 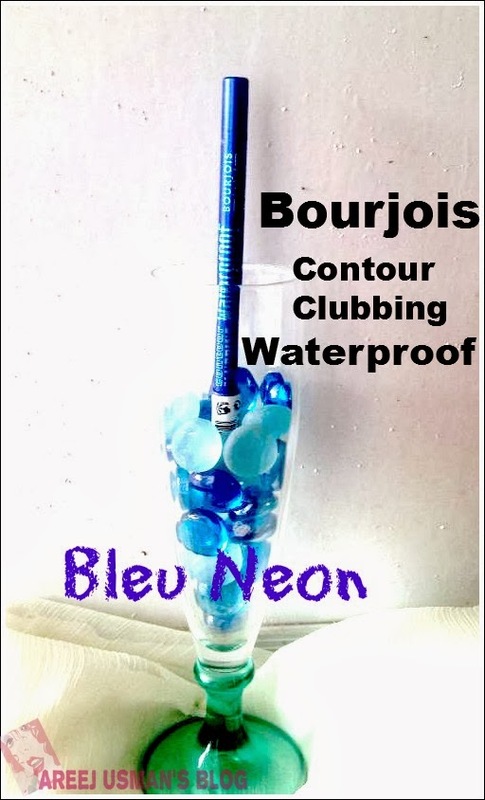 Its this lovely eyepencil by Bourjois called Contour Clubbing Waterproof Eye pencil in Bleu Neon. 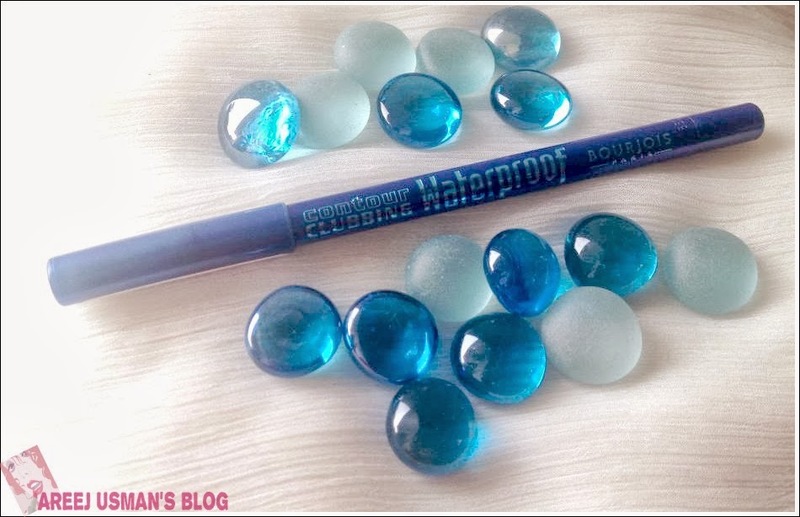 A waterproof pencil in vibrant colors. Discover the new contour clubbing waterproof eyepencil,ideal for those ultra-crazy nights out! The Contour Clubbing Waterproof eye pencil is the perfect finishing touch to a smoky look.Its waterproof formula is crease-resistant and makes for a perfect adherence of the colour. 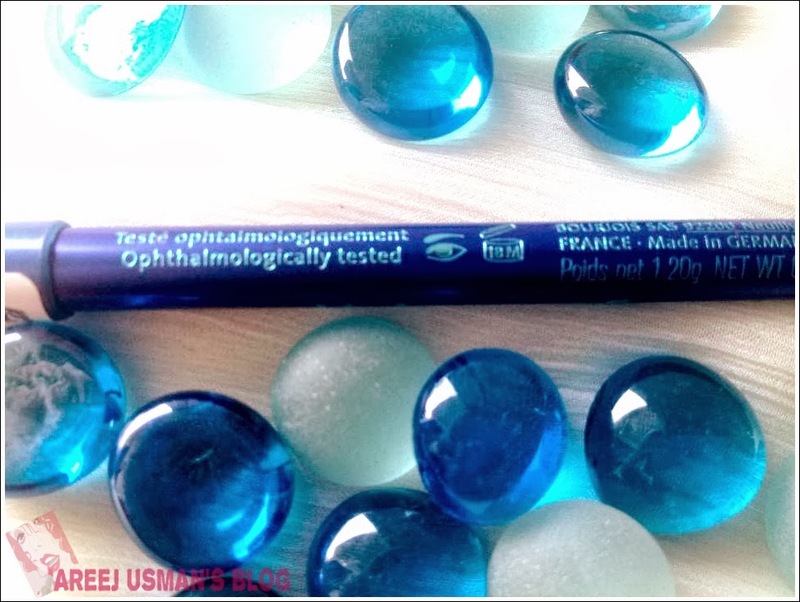 Its ultra-soft gliding texture enriched with jojoba and cotton oils intensely outlines the lash line.Remove with a waterproof make-up remover.Ophthalmologically tested. 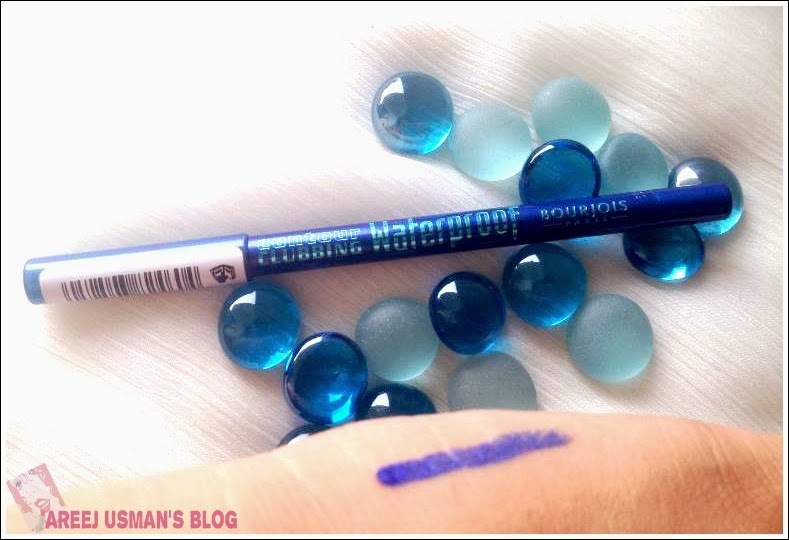 This is the creamiest of pencils.Its just like silk.Its softest to apply.It works well on both the upper lid and water line.I have already fallen in love with this eye pencil.I am thinking of buying one or more of other shades available in the same range.This eyeliner that I have here is called Bleu Neon.Its a very pretty metallic shade with shimmer in it.When you look closely at the tip of the pencil(sorry,no picture taken)you see loads of small glitter in it.But when you apply it on your eyelid it is a uniform application. 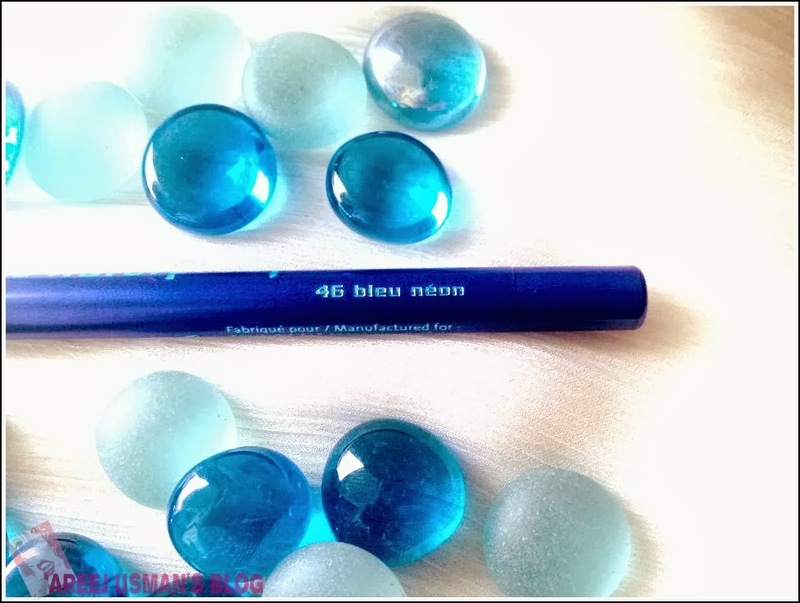 This shade is 45 Bleu Neon.There are 6 more shades available in the range. My eyes fall in the very sensitive category eyes.If I share my eyepencil or mascara with anyone I am bound to get an eye infection.I am also a regular lens user in everyday life.As I use prescription lenses its equally important for me to use lenses friendly products.I hate when I get watery eyes when I wear a certain eyepencil on my waterline.The small particles sometimes enter my eye and cause irritation.This pencil is opthalmologically tested and it literally doesn’t give me any kind of irritation and also as the formula is really creamy so no grainy particles come off.Its good to wear on the waterline as well.But I prefer to use it on my upper lid.The product can be used for an year and a half i.e 18 months after it comes into use. This eyepencil is waterproof as it says.And to add to the good points its smudgeproof as well.It stays put on the eyelids for a good 10,11 hours.Though after that on oily eyelids like mine it does transfer a bit to the upper area.But overall its formula is very long lasting and has a good staying power.I love how it brightens up my eye.You can wear it alone on upper eye as I have done in the swatches below.You can also glide it just below the lower lashes to create an intense look.Combined with black eyeliner on the upper lid it looks awesome as well. The pencil is made of plastic and is sharpenable.But has no attached sharpener with it.A usual cosmetic sharpener is good enough to sharp it. Here is a swatch of the lovely BLEU NEON on my hand.Cant help but keep looking at how pretty it is. 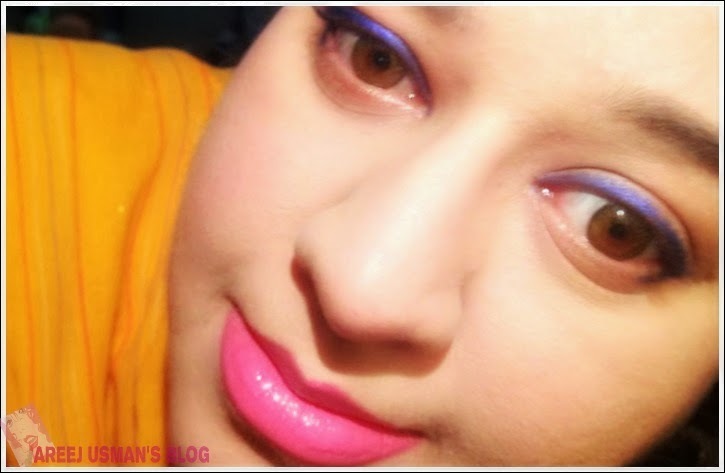 Here are some pictures to show you how this eyepencil looks on my eyes. I am not wearing any eyeshadow base and mascara in the pictures. I totally recommend this eye pencil to all you eyeliner lovers.This is not to be missed if you are looking for a really good quality eye pencil that stays put for hours without smudging.Its pigmentation is great.You will not regret buying it.There are so many colors to choose from.I literally want to collect all of them! 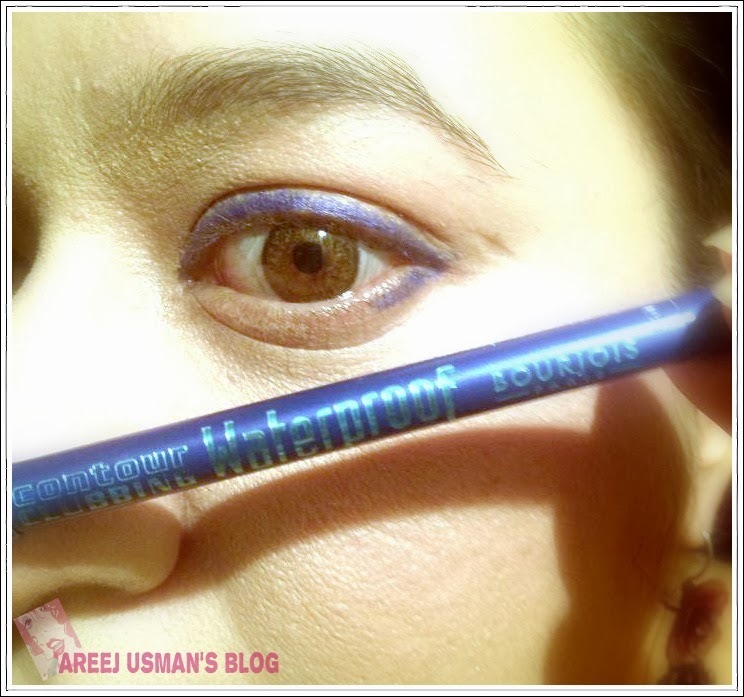 You can get yours from any Bourjois counter at a drugstore near you. For online orders within Pakistan check out Justforgirls.pk & Beauutyarena. A small Post EID Hello! That looks lovely! Will definitely keep an eye on that one. looking so beautiful on you…..